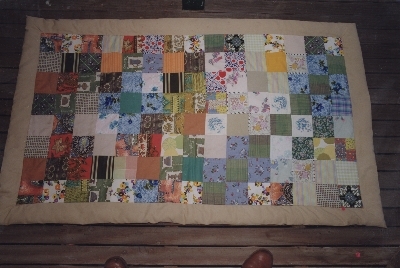 This quilt was made by Marjorie Treasy at 'The Mount' Dumbalk Nth, Victoria in the mid 1960s. It is one of three made about the same time. It is either stored or in use on one of two single beds. "Mum is in good health and at 86 is quite active and lives alone with her garden to care for. She drives and has been very involved with many organisations and still drives to meetings of church, CWA, Elderly Citizens Club, bowls (indoor), flower shows (ex judge) with her friends. Life member of CWA. 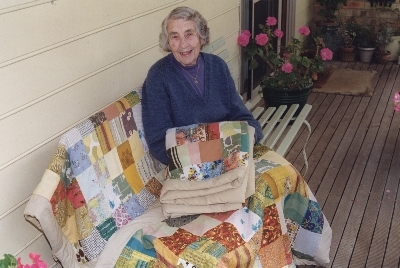 Farm life at Mirboo in her youth and during the depression has given her a deeply ingrained sense of being resourceful and a habit of naturally recycling everything. She lives well but is never wasteful. We think she is wonderful."